Habit: Annual, perennial herb, erect to sprawling; taprooted. Leaf: thread-like to linear, vein 1; stipules 1--11 mm, lanceolate to widely triangular, scarious, +- entire or splitting +- at tip, white to tan. Inflorescence: terminal, open to dense; flowers few to many; pedicels 0.5--28+ mm. Flower: sepals 5, united in basal 1/5, 1.5--10 mm, lanceolate to ovate, glabrous to glandular-hairy; petals 5, 0.6--9 mm, entire; stamens 2--10; styles 3, 0.3--1.9 mm. Fruit: capsule, ovoid; valves 3, spreading, tip recurved. Seed: few to many, dark brown, red-brown, or black, often winged. Habit: Annual or short-lived perennial herb, delicate. Stem: lower main 0.3--0.5 mm diam. Leaf: barely fleshy, 2--4+ per axillary cluster; stipules generally 3.5--5 mm, conspicuous, lanceolate, shiny, white, tip +- long-acuminate. Inflorescence: 1--3+ × compound or flowers 1 in axils; glandular-hairy. Flower: sepals fused 0.5--0.7 mm, lobes 2--3.2 mm, in fruit < 4 mm; petals pink; stamens 6--10; styles 0.6--0.8 mm. Fruit: 3.5--5 mm, 1--1.2 × calyx. Seed: 0.4--0.6 mm, red-brown to dark brown, wing 0; sculpture worm-like, minutely papillate. Chromosomes: 2n=18,36,54. 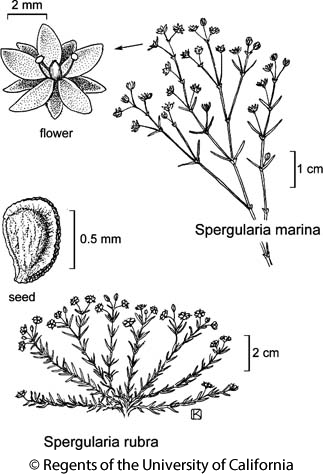 Citation for this treatment: Ronald L. Hartman & Richard K. Rabeler 2012, Spergularia rubra, in Jepson Flora Project (eds.) Jepson eFlora, http://ucjeps.berkeley.edu/eflora/eflora_display.php?tid=45090, accessed on April 25, 2019. NW, CaR, c SNF, n&c SNH, ScV, CW, SCo, SnGb, PR, DMtns; Markers link to CCH specimen records. Yellow markers indicate records that may provide evidence for eFlora range revision or may have georeferencing or identification issues. Purple markers indicate specimens collected from a garden, greenhouse, or other non-wild location.